On September 10th, we hosted our last chapter outing of the year. It was such a beautiful day that many took advantage of the opportunity to take off of work and get out fishing early. The combination of nice weather and the fact that it was our final outing boosted registration and attendance to the best of the year with a total of 25 members. 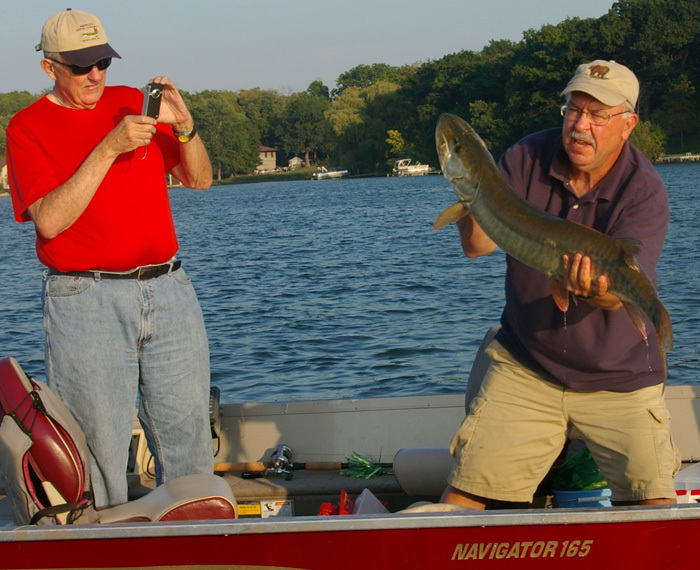 It was definitely a casting bite with 6 legal muskies being caught during the official outing hours. All of the fish were caught casting. Dave Dawson won the fishing contest with two fish, a 43.5″ and a 37.5″. Rick Wyrwas also caught two fish and was a close second place with a 40″ and 32″. Jim Kwapil caught a 38.25″ and our newest member, Jim Frett, caught a 33″. Nice job everyone! The gathering afterwards brought us all together for some good food and drinks while we exchanged stories and celebrated Darlene Kwapil’s 50th birthday. We had a special drawing for a $100 gift certificate to Smokey’s which was won by Amy Heidenreich. We also had 3 bottles of wine which were won by Pat Guarnaccio, Jim Dembeic, and Jim Kwapil. Thanks again to our hosts John and Gordy, we appreciate them allowing us to continue to have our gatherings at Smokey’s West. Thanks to everyone for coming out and making the outings so much fun. We hope to see more of you join us next year!